Last night, the Memphis City Council held a committee meeting to decide whether to add Ida B. Wells’ name to Forrest Park. The park is named after the famous Civil War general, Nathan Bedford Forrest. Recently, the Sons of Confederate Veterans placed a large granite marker at the park, but city officials took the liberty of removing it over Christmas. Since then, the issue has become a hot topic. City council member Myron Lowry suggested adding Wells’ name, but he was not in attendance at last night’s meeting. One city council member, however, didn’t hesitate to voice her opinion. Janis Fullilove got so riled up that she burst into tears and left the meeting. Really, Ms. Fullilove? Apparently she is misinformed about General Forrest by thinking that he started the Ku Klux Klan. Lee Millar of the SCV stated as much. Fullilove has been arrested on numerous occasions for drunk driving, and still, she maintains her position on the city council. She disrupted the hearing by making faces throughout. Regardless of her absurd behavior, no resolution was agreed upon about renaming the park. City Council member Bill Boyd said that he thinks Ida B. Wells, who was a civil rights activist, should get her own park, and that the marker for Forrest Park should be replaced. A Confederate soldier finally received his grave marker 88 years after his death. Andrew L. Robinson, who enlisted on June 15, 1861, was a private with the 48th Virginia Infantry. According to a story in the Civil War Courier, Robinson was wounded three times at the battles of Winchester, Virginia, Sharpsburg, Virginia, and Hatcher’s Run battle, fought just south of Richmond, Virginia. He was shot in the head at the Battle of Hatcher’s Run, and taken to Chimborazo Hospital in Richmond, which was the world’s largest hospital at that time. After he was discharged from the hospital, he returned to his regiment, but was captured at Jonesboro, Tennessee. After being freed on May 22, 1865, he returned home, and lived the rest of his life in Sullivan County, Tennessee. He died in 1924. His second great-grand-niece, Rhonda Cookenour Turner, investigated his information to discover the whereabouts of his grave. On November 3 of last year, a Confederate marker, provided by the Veterans Administration, was installed by Commander Rick Morrell of the Sons of Confederate Veterans, Bristol Camp #52. The marker was dedicated at Arcadia United Methodist Church Cemetery in Kingsport, Tennessee with full military honors. Last July,local chapters of the Sons of Confederate Veterans came together to purchase a monument in Nathan Bedford Forrest Park in Memphis, Tennessee. 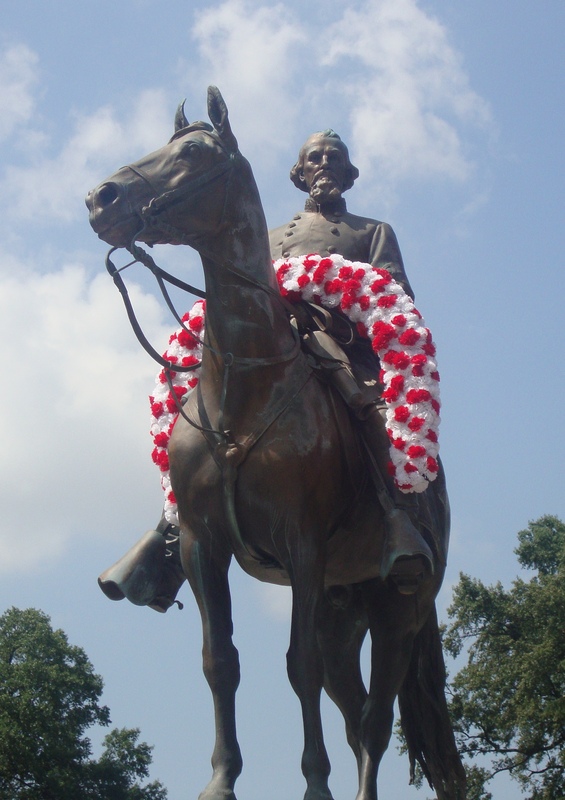 The 10′ long, 2 ton granite marker, which simply states “Forrest Park,” was placed in the park, proudly displayed beneath the regal statue of Confederate General Forrest sitting atop his steed, and facing busy Union Avenue. Suddenly, the monument went missing last night. Apparently, the city of Memphis decided after months that the SCV failed to obtain a permit for the monument, so they removed it. A permit was obtained from the previous director of the Parks and Recreation department, but of course, he is no longer working for the city. Somehow, the paperwork went missing as well. Strange but true. It’s a good thing General Forrest isn’t alive to see how his reputation and memory have been tainted. If he was, I’m sure he’d raise hell! Last Thursday evening, I had the privilege of being invited to Ripley, Mississippi to meet members of the Sons of Confederate Veterans Camp #868, the “Tippah Tigers,” where I gave a discussion about my new novel, A Beautiful Glittering Lie. I had the most wonderful time meeting these folks, who were very hospitable and accommodating. After being fed a hearty meal of vegetable soup and chili, the meeting commenced, and I discussed my motivation for writing the book, as well as the series of which it is a part. 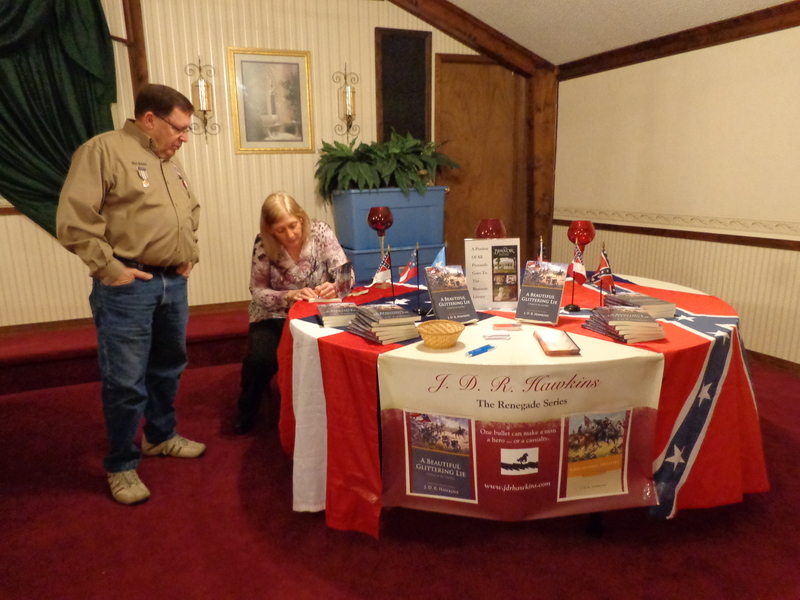 I explained how I came up with the characters, and how the book is based on a diary written by a member of the 4th Alabama Infantry Regiment. Afterward, I was invited to sign copies for members. Thank you very much, Tippah Tigers, for your kind invitation. I hope we get the chance to meet again in the near future!